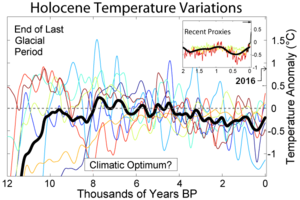 Temperature variations during the Holocene from a collection of different reconstructions and their average. The most recent period is on the right, but the recent warming is only seen in the inset. The Holocene Climate Optimum warm event consisted of increases of up to 4 °C near the North Pole (in one study, winter warming of 3 to 9 °C and summer of 2 to 6 °C in northern central Siberia). Northwestern Europe experienced warming, but there was cooling in Southern Europe. The average temperature change appears to have declined rapidly with latitude and so essentially no change in mean temperature is reported at low and middle latitudes. Tropical reefs tend to show temperature increases of less than 1 °C; the tropical ocean surface at the Great Barrier Reef about 5350 years ago was 1 °C warmer and enriched in 18O by 0.5 per mil relative to modern seawater. In terms of the global average, temperatures were probably warmer than now (depending on estimates of latitude dependence and seasonality in response patterns). While temperatures in the Northern Hemisphere were warmer than average during the summers, the Tropics and parts of the Southern Hemisphere were colder than average. Out of 140 sites across the western Arctic, there is clear evidence for conditions warmer than now at 120 sites. At 16 sites, where quantitative estimates have been obtained, local HTM temperatures were on average 1.6±0.8 °C higher than now. Northwestern North America had peak warmth first, from 11,000 to 9,000 years ago, and the Laurentide ice sheet still chilled the continent. Northeastern North America experienced peak warming 4,000 years later. Along the Arctic Coastal Plain in Alaska, there are indications of summer temperatures 2–3 °C warmer than present. Research indicates that the Arctic had less sea ice than the present. Current desert regions of Central Asia were extensively forested due to higher rainfall, and the warm temperate forest belts in China and Japan were extended northwards. West African sediments additionally record the African Humid Period, an interval, between 16,000 and 6,000 years ago, when Africa was much wetter. This was caused by a strengthening of the African monsoon by changes in summer radiation, resulting from long-term variations in the Earth's orbit around the Sun. The "Green Sahara" was dotted with numerous lakes, containing typical African lake crocodile and hippopotamus fauna. A curious discovery from the marine sediments is that the transitions into and out of the wet period occurred within decades, not the previously-thought extended periods. It is hypothesized that humans played a role in altering the vegetation structure of North Africa at some point after 8,000 years ago, when they introduced domesticated animals. This introduction contributed to the rapid transition to the arid conditions found in many locations in the Sahara. In the far Southern Hemisphere (New Zealand and Antarctica), the warmest period during the Holocene appears to have been roughly 8,000 to 10,500 years ago, immediately following the end of the last ice age. By 6,000 years ago, the time normally associated with the Holocene Climatic Optimum in the Northern Hemisphere, they had reached temperatures similar to present ones, and they did not participate in the temperature changes of the north. However, some authors have used the term "Holocene Climatic Optimum" to describe the earlier southern warm period, as well. A comparison of the delta profiles at Byrd Station, West Antarctica (2164 m ice core recovered, 1968) and Camp Century, Northwest Greenland, shows the post glacial climatic optimum. Points of correlation indicate that in these two locations the Holocene climatic optimum (post glacial climatic optimum) probably occurred at the same time. A similar comparison is evident between the Dye 3 1979 and Camp Century 1963 cores regarding this period. The Hans Tausen Iskappe (ice cap) in Peary Land (northern Greenland) was drilled in 1977 with a new deep drill to 325 m. The ice core contained distinct melt layers all the way to bedrock indicating that Hans Tausen Iskappe contains no ice from the last glaciation; i.e., the world’s northernmost ice cap melted away during the post-glacial climatic optimum and was rebuilt when the climate got colder some 4000 years ago. From the delta-profile, the Renland ice cap in the Scoresby Sound has always been separated from the inland ice, yet all the delta-leaps revealed in the Camp Century 1963 core recurred in the Renland 1985 ice core. The Renland ice core from East Greenland apparently covers a full glacial cycle from the Holocene into the previous Eemian interglacial. The Renland ice core is 325 m long. Although the depths are different, the GRIP and NGRIP cores also contain this climatic optimum at very similar times. The climatic event was probably a result of predictable changes in the Earth's orbit (Milankovitch cycles) and a continuation of changes that caused the end of the last glacial period. The effect would have had maximum Northern Hemisphere heating 9,000 years ago, when the axial tilt was 24° and the nearest approach to the Sun (perihelion) was during the Northern Hemisphere's summer. The calculated Milankovitch Forcing would have provided 0.2% more solar radiation (+40 W/m2) to the Northern Hemisphere in summer, tending to cause greater heating. There seems to have been the predicted southward shift in the global band of thunderstorms, the Intertropical Convergence Zone. However, orbital forcing would predict maximum climate response several thousand years earlier than those observed in the Northern Hemisphere. The delay may be a result of the continuing changes in climate as the Earth emerged from the last glacial period and related to ice-albedo feedback. It should also be noted that different sites often show climate changes at somewhat different times and lasting for different durations. At some locations, climate changes may have begun as early as 11,000 years ago or persisted until 4,000 years ago. As noted above, the warmest interval in the far south significantly preceded warming in the north. While significant temperature changes do not appear to have been at most low latitude sites, other climate changes have been reported, such as significantly wetter conditions in Africa, Australia and Japan and desert-like conditions in the Midwestern United States. Areas around the Amazon show temperature increases and drier conditions. ^ Davis, B.A.S. ; Brewer, S.; Stevenson, A.C.; Guiot, J. (2003). "The temperature of Europe during the Holocene reconstructed from pollen data". Quaternary Science Reviews. 22 (15–17): 1701–16. Bibcode:2003QSRv...22.1701D. CiteSeerX 10.1.1.112.140. doi:10.1016/S0277-3791(03)00173-2. ^ Gagan, Michael K.; Ayliffe, LK; Hopley, D; Cali, JA; Mortimer, GE; Chappell, J; McCulloch, MT; Head, MJ (1998). "Temperature and Surface-Ocean Water Balance of the Mid-Holocene Tropical Western Pacific". Science. 279 (5353): 1014–8. Bibcode:1998Sci...279.1014G. doi:10.1126/science.279.5353.1014. PMID 9461430. ^ Kitoh, Akio; Murakami, Shigenori (2002). "Tropical Pacific climate at the mid-Holocene and the Last Glacial Maximum". Paleoceanography. 17 (3): 1047. Bibcode:2002PalOc..17c..19K. doi:10.1029/2001PA000724. Archived from the original on January 19, 2010. ^ D.S. Kaufman; T.A. Ager; N.J. Anderson; P.M. Anderson; J.T. Andrews; P.J. Bartlein; L.B. Brubaker; L.L. Coats; L.C. Cwynar; M.L. Duvall; A.S. Dyke; M.E. Edwards; W.R. Eisner; K. Gajewski; A. Geirsdottir; F.S. Hu; A.E. Jennings; M.R. Kaplan; M.W. Kerwin; A.V. Lozhkin; G.M. MacDonald; G.H. Miller; C.J. Mock; W.W. Oswald; B.L. Otto-Bliesner; D.F. Porinchu; K. Ruhland; J.P. Smol; E.J. Steig; B.B. Wolfe (2004). "Holocene thermal maximum in the western Arctic (0-180 W)". Quaternary Science Reviews. 23 (5–6): 529–560. Bibcode:2004QSRv...23..529K. doi:10.1016/j.quascirev.2003.09.007. ^ "NSIDC Arctic Sea Ice News". National Snow and Ice Data Center. Retrieved 15 May 2009. ^ "Eurasia During the Last 150,000 Years". Archived from the original on 8 June 2012. Retrieved 7 June 2012. ^ "Abrupt Climate Changes Revisited: How Serious and How Likely?". USGCRP Seminar, 23 February 1998. Retrieved May 18, 2005. ^ Wright, David K. (26 January 2017). "Humans as Agents in the Termination of the African Humid Period". Frontiers in Earth Science. 5: 4. Bibcode:2017FrEaS...5....4W. doi:10.3389/feart.2017.00004. ^ Masson, V.; Vimeux, F.; Jouzel, J.; Morgan, V.; Delmotte, M.; Ciais,P. ; Hammer, C.; Johnsen, S.; Lipenkov, V.Y. ; Mosley-Thompson, E.; Petit, J.-R.; Steig, E.J. ; Stievenard, M.; Vaikmae, R. (2000). "Holocene climate variability in Antarctica based on 11 ice-core isotopic records". Quaternary Research. 54 (3): 348–358. Bibcode:2000QuRes..54..348M. doi:10.1006/qres.2000.2172. ^ P.W. Williams; D.N.T. King; J.-X. Zhao K.D. Collerson (2004). "Speleothem master chronologies: combined Holocene 18O and 13C records from the North Island of New Zealand and their paleoenvironmental interpretation". The Holocene. 14 (2): 194–208. doi:10.1191/0959683604hl676rp. ^ a b c d e Dansgaard W (2004). Frozen Annals Greenland Ice Sheet Research. Odder, Denmark: Narayana Press. p. 124. ISBN 978-87-990078-0-6. ^ Hansson M, Holmén K (Nov 2001). "High latitude biospheric activity during the Last Glacial Cycle revealed by ammonium variations in Greenland Ice Cores". Geophys. Res. Lett. 28 (22): 4239–42. Bibcode:2001GeoRL..28.4239H. doi:10.1029/2000GL012317. This page was last edited on 1 April 2019, at 09:37 (UTC).